The Boeing CC-177 Globemaster III, escorted by two Boeing CF-18 Hornet fighter jets from 3 Wing Bagotville, Quebec, Canada, circled gracefully and in perfect formation around the Department of National Defence’s headquarters building in Ottawa and then turned south towards the Ottawa airport. Onboard the Globemaster, which is operated by the Royal Canadian Air Force 429 Transport Squadron, located at 8 Wing Trenton, Ontario, were more than 90 passengers who have written a page in the history of Canada. They were the last Canadian troops to leave Afghanistan at the end of more than 12 years of Canadian Armed Forces operations there. 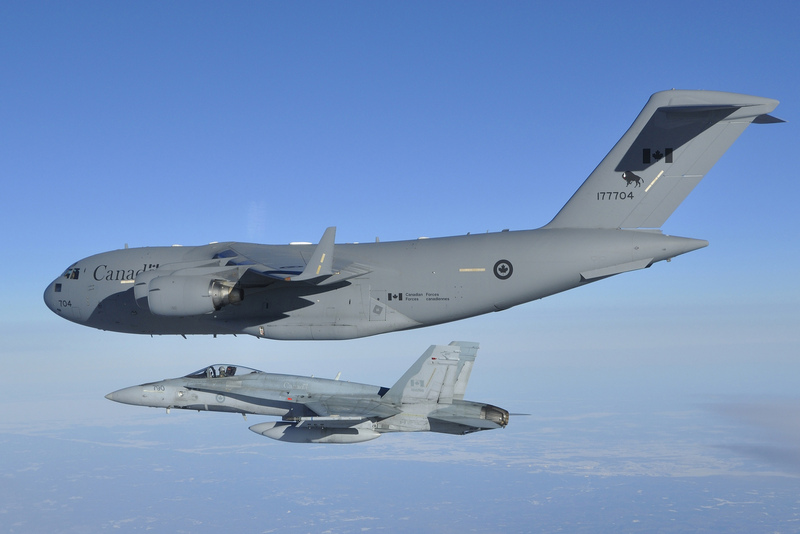 Colonel Paul Prévost, a former commander of 3 Wing Bagotville who has both flown a CF-18 escorting previous flights home and been a passenger returning from Afghanistan, told CFRA radio’s Steve Madely what it’s like. For photos and the complete story by Joanna Calder via the Royal Canadian Air Force, click here.